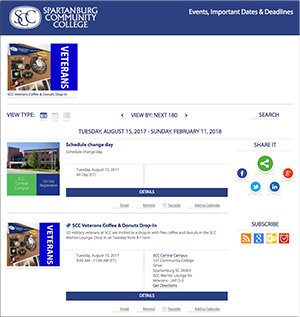 Spartanburg Community College can now more easily schedule, promote and manage campus events with a centralized, shared calendar. The institution is using Event Publisher, an event management platform from SchoolDude by Dude Solutions, to organize student activities, academic calendars, holidays, financial aid deadlines and more. In the past, the college's academic and student calendars were updated manually by multiple departments — and communication was often a problem. "We needed a platform that would unify the posting and promotion of public events, student life activities and career services calendars for easy viewing," said Jane Bird, creative manager and webmaster at Spartanburg, in a statement. "By using Event Publisher, we are reducing our previous workload by two weeks, since we no longer have to manually input event details across multiple calendars." Event Publisher allows users to create and publish upcoming events on a public or private institutional calendar. Built-in event promotion and social sharing tools streamline the process of publicizing events. And analytics features provide users with real-time data to track registrations, collections and payments. "Event Publisher is customizable with our college's branding, so the change was seamless," continued Bird. "Another huge benefit has been the ease of event posting in one central location across the website and on social media channels, which was very cumbersome before." For more information, visit the Dude Solutions site.